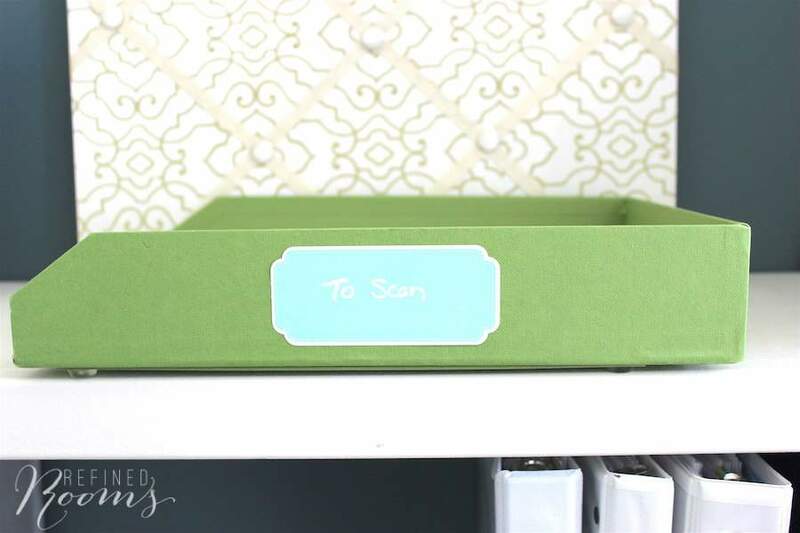 Welcome to week 2 of Going Paper-less month in the Organize & Refine Your Home Challenge. 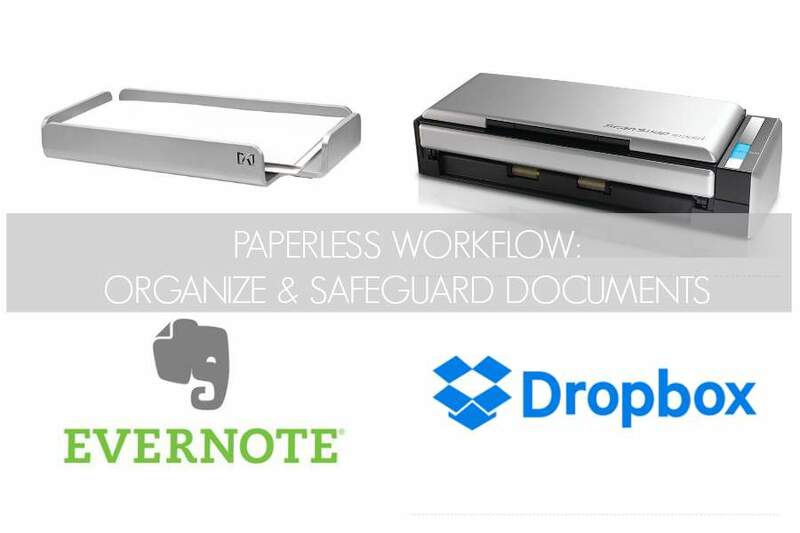 We started the month by reviewing the basics of going paperless, including tools for scanning your documents. This week, we’re focusing on your paperless workflow. Last week’s assignment was to determine which scanning method(s) you’ll use. This week, we’ll be addressing steps 2 and 3 of the process. Your paperless workflow is the process by which a piece of paper is transformed into a digital file and subsequently stored, organized, and protected. You’ll need to make some key decisions about where you’ll put all of the documents that you’ll be scanning and how you’ll organize those documents so that you can find them in the future. To illustrate what this process may look like for you, I’m sharing my process with you today. Whenever I come across a paper that needs to be scanned, I place it my “To Scan” inbox, which sits on a shelf in my office. I have a standing appointment in my calendar once a month to scan all of the documents in this inbox. Durning my monthly scanning appointment, I bring the inbox over to the dining room table, where I connect my Fujitzu Scansnap S1300i to my laptop and begin the process of scanning papers. I make certain that the OCR function is enabled (which makes the scanned PDF files searchable) and away I scan! 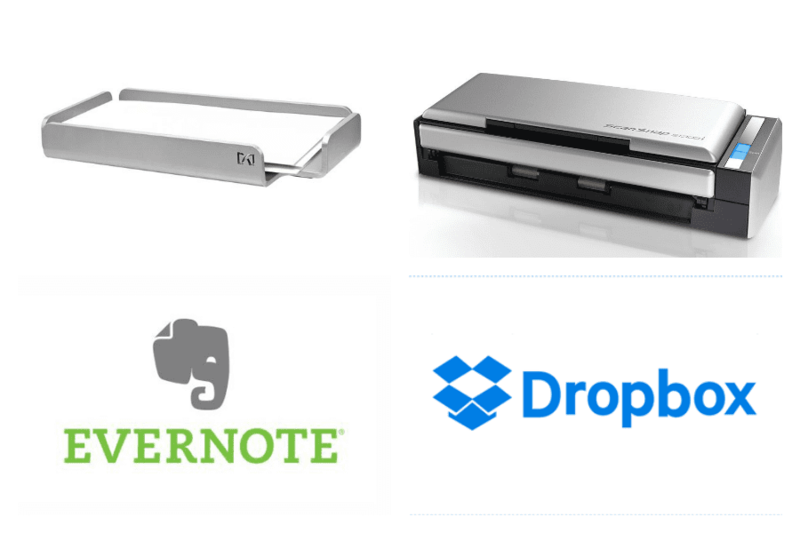 I store my scanned documents in one of two places: Dropbox or Evernote (I’ll talk more about which type of documents I store in each of these services below). 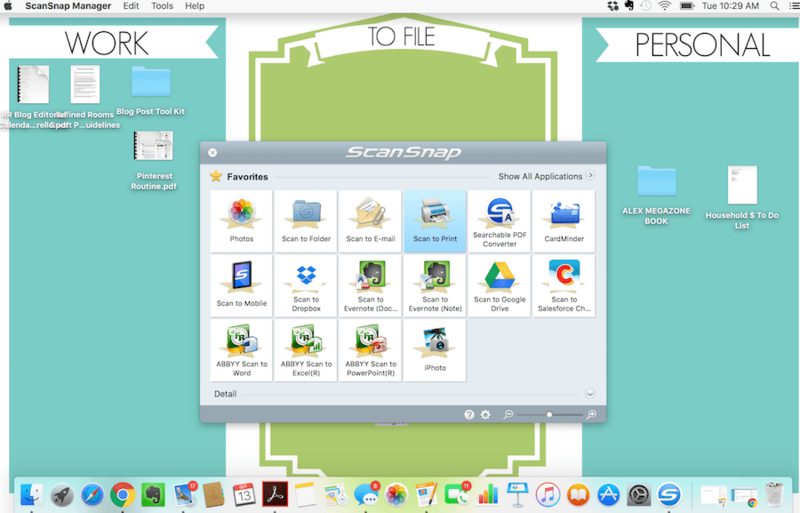 If I choose to save a document to Dropbox, the Scansnap QuickMenu gives me the opportunity to rename the file and choose a specific folder destination to store it within Dropbox. One of the keys to finding your documents later on down the road is to use a consistent and descriptive naming convention when renaming your scanned PDF documents. That way, if you can’t recall the specific Dropbox folder in which you stored your file, you can use your computer’s search function to locate the document. When naming my files, I use a naming convention similar to the naming convention I use for my digital photos. I typically include the year and month that the document was scanned (or a date that is relevant for the document, such as the month of the bank reconciliation report in the example below). The name will also include a description of the information contained within the document. I try to predict how I would search for this particular document in the future, and include those search terms in the document name. Check out this post on organizing tax documents to see another good example of consistent/descriptive naming conventions. For documents that I choose to save to Evernote, I click on the “Save to Evernote” button in the ScanSnap Quick Menu and the document is automatically uploaded to my Evernote Inbox. If I then open Evernote, I’ll see the document that I just scanned appear as a PDF contained within an Evernote note. Just like in Dropbox, the next step in the process is to rename the filename that’s automatically generated by the scanner to a name that includes a date a description of the document. In the example below, you see a receipt for a camera lense I recently purchased. I changed the name of the note containing the PDF to “2016 Adorama Canon Camera Lense“. After renaming the note, I also assign a series of tags to the note in order to make it easier to search for this document within Evernote. If you look on the top of the screenshot, you can see the tags I added, which include: “Big Ticket Receipts” “Camera” “Electronics”. If you’re new to Evernote, there’s a bit of a learning curve when it comes to understanding how information is organized in this application. It does not use a typical file/folder hierarchy system like you might use on your computer and/or in Dropbox. 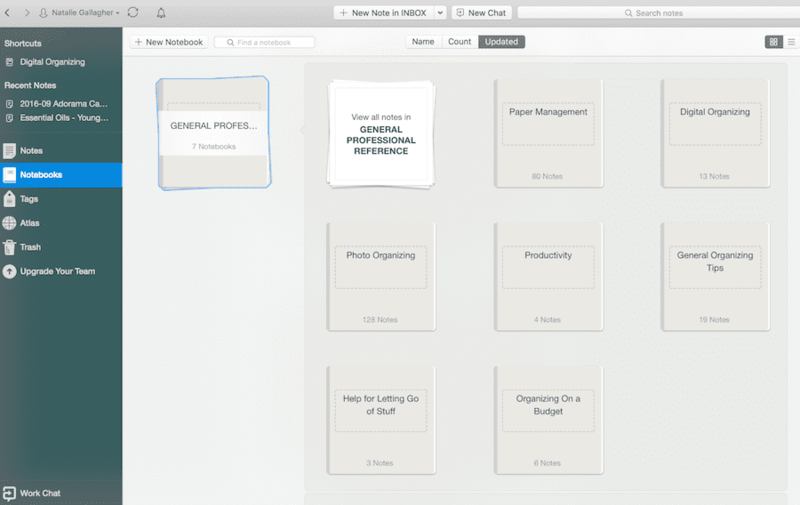 In Evernote, the basic organizational building block is a note. Notes can be organized into notebooks, and similar notebooks can be grouped together within a stack. 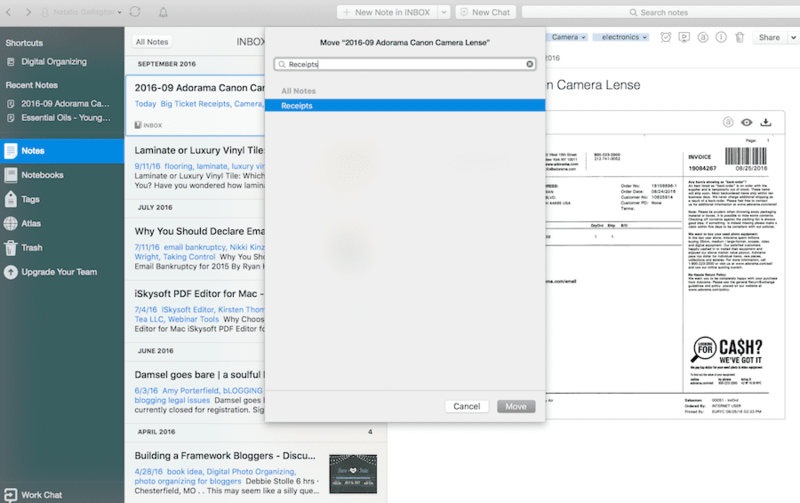 Evernote is a search-based technology. Although you can conceivably find documents by hunting through various notebooks and stacks, the real beauty of Evernote is that all of your documents can be made searchable by properly tagging your notes and by using Evernote’s in-house OCR technology (although you’ll need to invest in a paid Evernote plan to have access to this feature). I know many people who don’t use notebooks within Evernote. They simply upload all of their documents into Evernote, and rely solely on heavy tagging/search to find their documents. Although I know theoretically that this method of organization works, the OCD part of me likes to categorize my notes into broad topic notebooks. Sometimes, I enjoy the process of browsing through a specific notebook to see what’s in there (kinda like browsing the bookshelves at the library). To each his own, right? The beauty of using Evernote is that you can tailor it to suit your specific needs and preferences. 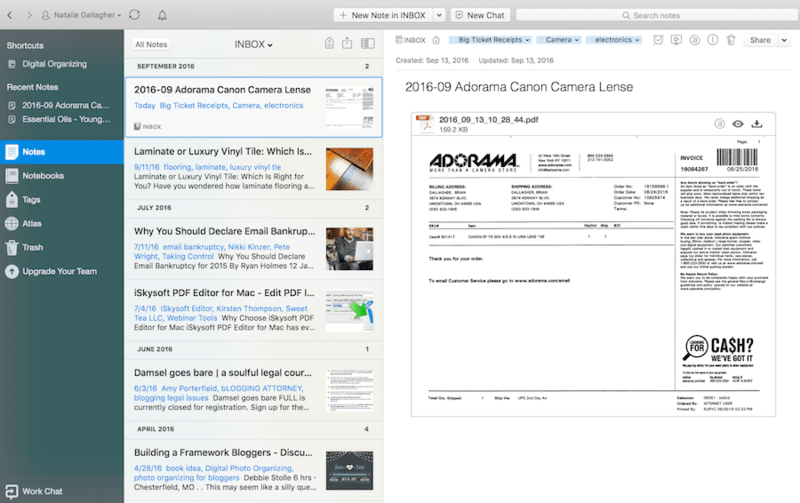 You’ve heard me rave about the brilliance that is Evernote many times before. In a perfect world, I’d use Evernote to store all of my documents. But the bottom line is that I don’t feel comfortable with the level of security that’s currently in place for Evernote when it comes to storing sensitive information within this platform. Although information is encrypted during the Evernote upload process, it’s important to understand that your information that’s stored in Evernote is NOT encrypted. As you’ll learn in the Going Paperless with Evernote webinar, there are work arounds that can make it possible to store sensitive information safely. Personally I’ve chosen to store things like vital documents, financial statements, and tax documents (basically, anything I want to keep out of the hands of an identity thief) in Dropbox. Dropbox has AES 256 bit encryption and SSL security (basically, bank-level). If you’re uber-paranoid, you can even put a two-step verification process in place to access your files. Why not just scan all your documents into basic file folders on your computer you ask? You can do that. But the beauty of using cloud services like Dropbox and Evernote is that you’re able to sync all of your documents across all of your devices. You can then access any document from anywhere. And that’s pretty cool, don’t you think? Perhaps the most important step in your paperless workflow is the last one…making sure that you safeguard all of your digital documents via a proper backup system. Wherever you ultimately store your documents, it’s crucial that your information lives in more than one place. 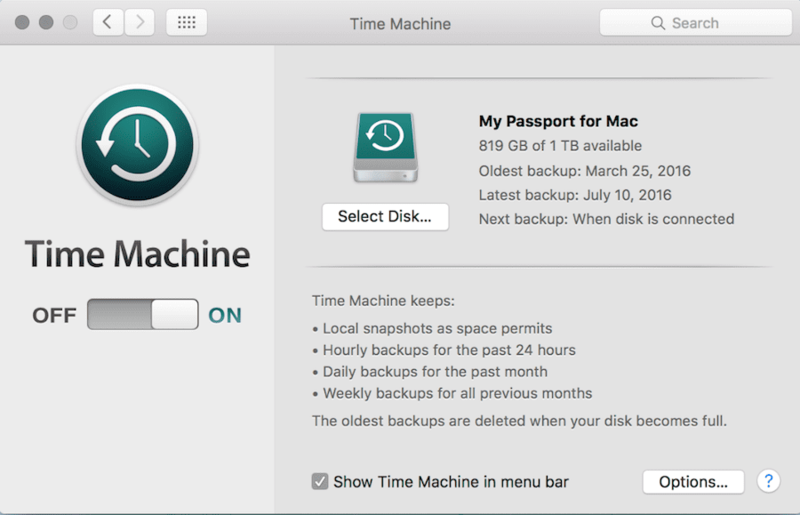 You can easily accomplish this if you’ve already put a proper backup system in place for your computer. Just make sure that the data files/folders that Evernote and Dropbox use to store your digital documents in is included in the general backup system you’ve put in place. Also, it’s a great idea to periodically create a backup of your Evernote data file via Evernote’s export function. 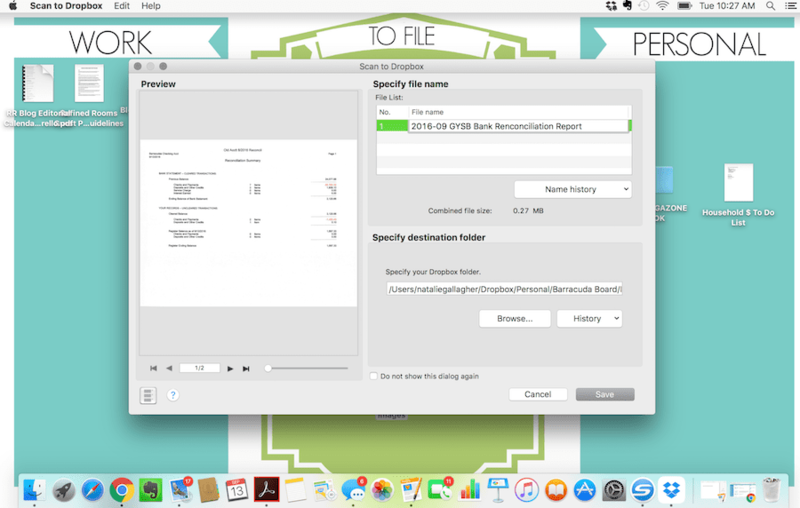 Here’s an awesome resource to walk you through the various ways to export data out of Evernote. 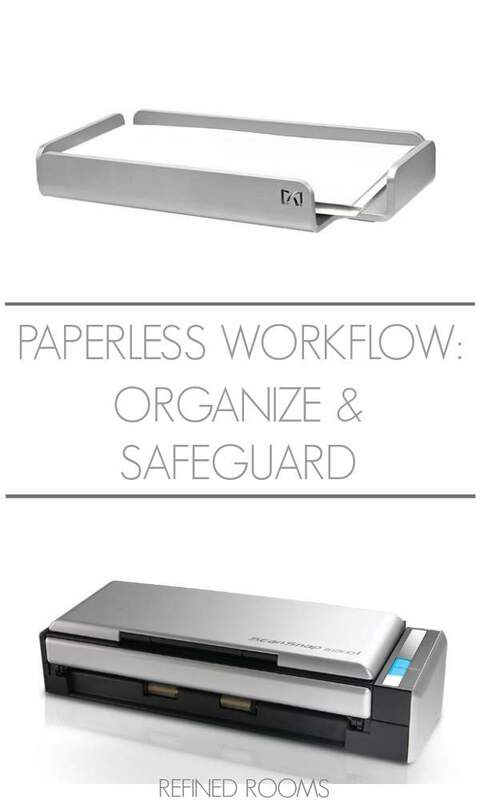 Also, be sure to check out the Paperless Document Organization Guide, and the Paperless Security Guide for more in-depth information on organizing and safeguarding your digital documents. Go forth and scan my Friend! I’d love for you to share a photo of your paperless workflow system via Instagram (use the hashtag #OrganizeandRefineChallenge) and/or share it in the comments below! 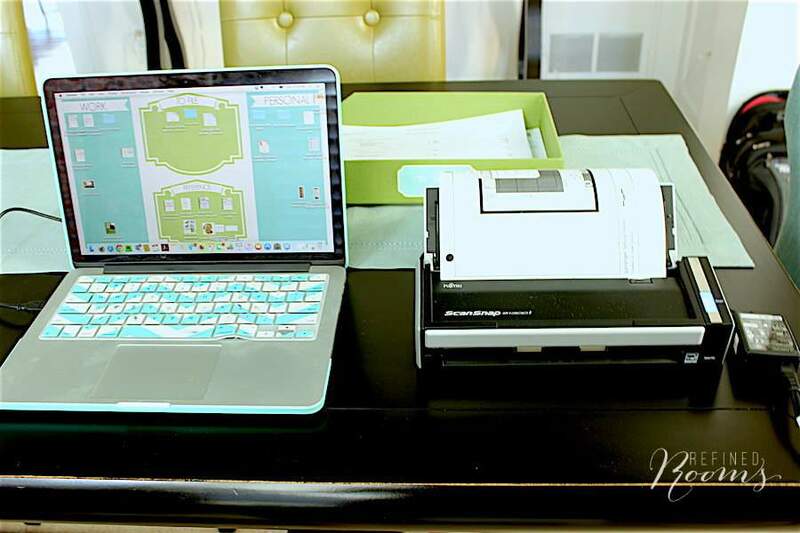 Thank you for this thorough and easy to follow post on going paperless. I especially love the visuals to see each step. I’m so glad you found it useful Ellen! Thank you for this detailed look at the process of storing digital documents. I am going to share this post with my clients and followers.